One of the rarest and most popular of the famous T series of baseball cards was issued by Obak Tobacco who inserted cards depicting Minor League players in packs of their cigarettes from 1909 through 1911. The Obak cards are very similar in size, design and coloring to the famous T206 cards which feature Major League players including the Honus Wagner card which has sold over 2.8 million dollars. The original Obak cards are in very high demand from baseball card collectors and as such have become highly valued with one individual card selling at auction recently for over $28,000. Obak Russian Cigaritos were first produced by the John Bollman Company of San Francisco during the 1860's in Factory 171, 1st Dist. State of Calif. Ownership of the John Bollman Co. passed first to The American Tobacco Company monopoly in 1900, then to the Liggett and Myers Tobacco Company. In order to stimulate the sales of their tobacco products, the company began inserting cards of local baseball players in their cigarettes. These baseball cards featured players from both the Pacific Coast League (PCL) (1909-11 releases) and the Northwest League (NWL) (1910-1911 releases). The Official American Card Catalog identifier is T212. The three original releases of Obak baseball cards contain a total of 426 cards, all depicting West Coast minor league players. The Obak box design did not vary at all between the series and the only distinguishing factor would be the difference in tax stamp and/or overprinting. 1909 Obak - This was the first year that Obak baseball cards were produced. The 1909 Obak Baseball Card Set featured 76 subjects, all from the PCL. Since the cards were made by the same company that produced the famous T206 cards, their size is the same, 1 ½" x 2 ⅝" and contain a white border. The 1909 release can be recognized by the Old English Script “Obak" on the back. All of the backs were printed in blue ink. A complete original set of this release has sold for over $26,000 at auction. 1910 Obak - The second issue year and the cards were again produced by the American Tobacco Company with the same size and specs of the 1909 release. This set contains players from the six PCL teams and the four NWL teams. In this release, 40 players can be found with either 150 subjects or 175 subjects printed on the back. The 150 subject variation is much more difficult to find. There are 35 different advertising slogans on the backs these cards. The 1910 release can be easily recognized by the BLOCK letter “OBAK" on the back. All of the backs are printed in blue ink. 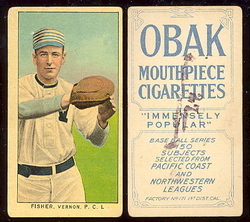 1911 Obak - The final year of production for the original Obak baseball card brand. The 1911 Obak Baseball set featured players from the six PCL teams and the four NWL teams. These teams included professional clubs from Spokane, Tacoma, Vancouver, Los Angeles, Oakland, Portland, Sacramento, San Francisco, Vernon, and Seattle. This year is noticeably different from the previous two years as the backs are printed in red ink and contain a bio and statistics. The stats are a first for minor league cards. 2009 TRISTAR Obak - This release features 114 base cards with players selected from the minor leagues. Each base card measures the modern size 2 ½" x 3 ½" and contains a modernized 1909 Obak back. Printed in blue ink, each card helps define the history and future of minor league baseball. The checklist includes a combination of current minor league prospects and MLB Hall of Famers.